The fruits might be small, but Goji berries pack a healthy punch to anyone who consumes them! Amazingly nutritious and so easy to grow, this fruit bearing shrub is finally making inroads from the Far East to American gardens. Goji Berry has been a staple of Far Eastern diets for many years, but the antioxidant-rich, protein-intensive berry is now coming to our plates...via an easy, fast-growing vining shrub. Goji Berry has been awarded the title of a 'Superfruit' because it so rich in health benefits. Nearly 13% protein, it is also very high in vitamin C, and is a powerful antioxidant...moreso than even blueberries. In mid to late spring, the Sweet Lifeberry® Goji Berry plant in my landscape begins to produce lots of brilliant royal-purple flowers up and down all its flexible, arching branches. No pollinator is required however two plants will increase yields on both plants. Within just a few weeks after flowering loads of the superfruit start to form that you can later pick and eat fresh off the bush until the first heavy frost. The fruits can also be dried for a sweet amd tasty treat much like raisins. The fruits grow sweeter as they mature on the plant. TIP: Avoid touching the berries whe they are, which may cause them to blacken when handled. Wait to touch or pick fruits until ripe. TIP: Goji Berry is self-fertile however planting two plants will increase fruit production on both plants. Goji Berry may take a season to establish itself in your garden or edible landscape, but once it makes itself at home, expect it to put on 4 to 5 feet of growth a year reaching 10 feet in height with a spread of 5 to 7 feet. With this in mind, you may want to prune it down to bush form by giving it an annual late-winter "haircut." Or, if you prefer, shape it into a small single-stemmed tree. If this is too much bother, just let it grow naturally into a cascading shrub. Very versatile, it flowers and fruits generously in any form, but I think it does much better with an annual pruning. Goji Berry plants are deer resistant. Plant as a single specimen (does not require a pollinator), in groupings or as a hedge. You can also grow it as a single-trunk small tree or on a fence, trellis or stake for even easyer picking of fruit. A great addition to the edible landscape. Though they sound exotic and are most often found with a high price tag in health food stores, Goji berries are actually easy to grow, hardy plants. You can grow them as a mounding shrub or train them to a trellis or pole for easy picking. The plants are deer resistant! SOIL: Prefers a well-drained, fertile soil with a neutral to alkaline soil pH (7.0 - 8.0 pH). 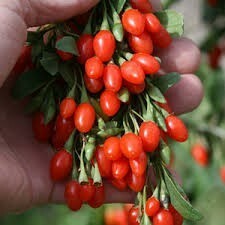 SUN: Goji Berry likes and performs best in full sun but will tolerate some light shade in the South. SPACING: When planting as a hedge or in groupings, I suggest spacing plants about 5 feet "on center" (from the middle of one plant in the row to the middle of the next plant in the row). If you are planting a grouping, and don't want the plants to ever touch, a spacing of 8 feet or more is recommended. PLANTING: Plant using the same method as you would any shrub. FEEDING: I recommend feeding Goji Berry plants after new growth begins to emerge in spring using a natural or organic fertilizer such as Nitroganic Fertilizer, which is a totally "goof proof," non-burning, organic plant food. WATERING: During the first growing season after planting, provide enough water to keep the soil moist but not constantly soggy. Thereafter, when plants have established themselves, supplental water might be necessary during prolonged periods of dry weather to keep soil moist, but not wet. PRUNING: Goji Berry plants do not require pruning however can benefit from a once-a-year pruning in late winter. Simply cut branches back to about half their length. 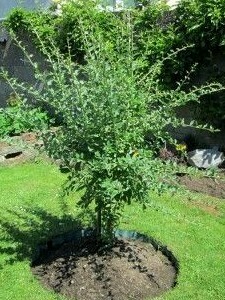 You can also grow it as a single-trunk small tree or train it to a trellis, fence or post for easier access to fruit. 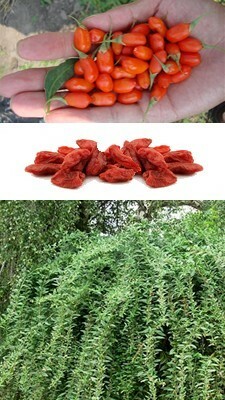 PROBLEMS: I've seen no serious insect or disease problems with Goji Berry. Constantly soggy soil can cause problems with the roots that might effect the entire plant.